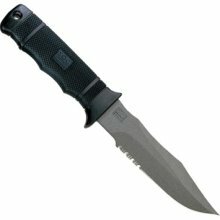 Wylaco carries an extensive line of top quality SOG knives and are one of their biggest retailers in the USA. Some SOG knives are special order and may take longer to get, we do have a extensive inventory though. If you have inventory questions please call before ordering. The Brous series of knives have been designed in conjunction with Jason Brous, a 10-year CNC machinist and custom knife maker. Brous prefers to use stock removal and grinded bevels to create his “functional fantasy” knife designs. SOG is proud to be collaborating with this up and coming knife designer to produce innovative new products, like this 9CR18MoV stainless steel blade, with a molded hard ..
Building upon SOG’s long tradition of honoring Japanese knife makers, the new fixed-blade Kiku uses the collaborative design talents of SOG and Kiku Matsuda, one of the foremost tactical knife designers in Japan. SOG and Master Kiku Matsuda have won awards on collaborations before, and this knife should turn heads, too. The elegant linen Micarta handle is rugged and easy to clean, while the AUS8 s..
Our battle proven SEAL Knife series has an incredible reputation for reliability and performance on fronts throughout the world. Building on this reputation wasn't easy. It took everything we had to top ourselves. But we think, you will think, that we have done it right.Racy new blade shape and longer cutting edge, extended tang for glass breaking and hammering7-inch partially serrated black TiNi ..
Seal Knife Series: After surviving one of the most extensive test and evaluation programs ever undertaken by the U.S. Government that included knives from most U.S. cutlery manufacturers, the SOG Seal knife triumphed. The Seals are one of the most specialized elite military groups in the world today. Seals must undergo one of the most rigorous training programs devised to produce the consummate wa.. The SEAL Pup carries on the tradition of quality and service of the SOG SEAL Knife, the chosen knife of the Navy SEALs. To earn this honor, the SEAL Knife surpassed one of the most extensive testing and evaluation programs ever undertaken by the US Government. For those who want all of the benefits of the original SEAL Knife, but in a smaller version, we have created the SEAL Pup. This storable bl..
There’s a feeling and intuition that comes when you’re in situations that demand your full attention. The Instinct is a compact, wearable fixed blade knife that is made just for those times. Available in two sizes and two handle types, it is suitable for many people. The Instinct offers multiply carry options. It can worn around the neck with a lanyard. It can be clipped to a belt or boot with the..
Its hollow ground drop point blade makes the Tangle perfect for most uses, sure. But you want to throw this knife, don’t you? Thanks to a full one-piece tang construction, you can. It’s strong. It’s balanced. It’s lightweight. It’s really only dependent upon your aim. Topped with a skeletonized handle – wrapped in 7 feet of paracord – and paired with a molded sheath and belt loop clip, you have yo.. Originally designed as back-up for law enforcement and military personnel, the Pentagon series is now popular with outdoor knife enthusiasts as well. The Pentagon offers the instant choice between a serrated or beveled edge for cutting options. Twin thumb notches enable accurate blade orientation and downward control. The aggressively checkered, flared handles provide confident gripping as well as..
Based on the SOG Bowie that helped founded our company, but morphed into a top-notch work knife with the use of technology, modern materials, and a little class thrown in for good measure. Our modern replica of the original Studies and Observation Group knife secretly developed and used in the Vietnam War by the 5th Special Forces and other elite soldiers. These individuals were specialists in rec..
After surviving one of the most extensive test and evaluation programs ever undertaken by the U.S. Government, including knives from most U.S. cutlery manufacturers, the SOG SEAL Knife triumphed. The SEALs are one of the most specialized elite military groups in the world today. SEALs must undergo one of the most rigorous training programs devised to produce the consummate warrior. Only a select f..
How appropriate that for our 20th anniversary we launch a new adaptation of the original SOG Bowie that founded the company. This new large format 7-1/2” blade will stun you with its exacting construction and precise grind lines. Unlike the originals, all parts are protected with our Hardcased Black TiNi coating that is the very best for appearance and performance. The stacked leather washer handl.. The newest member of the SEAL fixed-blade knife family, the SEAL Strike takes everything SOG has learned from years of real-world deployment and combines it into one spectacular package. This quality AUS-8 stainless steel, partially serrated blade is an excellent field companion for outdoor and underwater adventures. The SEAL Strike is serious business and carries on the tradition of supplying the.. The SCUBA/DEMO is the rarest of the Special Forces SOG knives. In fact, only one original is known to exist today. Originally 39 were made and 38 were delivered to the Naval Advisory Detachment for missions along the North Vietnamese coastline. Of the 38 issued, 36 were lost in operations and the other two were never seen again. Using current manufacturing techniques we are now able to create a sp..
For the primitive in all of us. When the only thing that separates you from them is your equipment, it better be good. Using SOG’s Hardcased black coating, the Jungle Primitive is durable and comfortable with a molded Kraton handle that features Digi-Grip, a way to guarantee gripping power where you need it. One can instantly turn the Primitive into a small machete, limb saw, or hammer. Includes a.. The SEAL Pup Elite is our high performance new edition to the existing SEAL family of products. Sometimes, we just 'have to have' more horsepower, the racing suspension, and every available option including sunroof. All kidding aside the SEAL Pup Elite is serious business and carries on the tradition of supplying the worlds elite military forces.Durable general purpose knife - ideal size for hikin.. The SOG Fillet Knife is everything you want in a fillet knife. 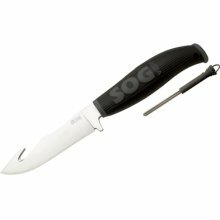 SOG’s purpose-driven fillet knife is definitely a keeper.The soft grippy handle and the flexible non-stick blade gives you maximum control and comfort while filleting. The included hard molded nylon sheath has a built-in single-stage sharpener, line cutter, and holes for easy drainage. The SOG Fillet Knives come in two blade lengths: 6.. The compact version of the original SOG Pentagon, the Mini Pentagon is a serious back-up knife that easily conceals in boot or vest. Extremely lightweight and comfortable to maneuver, the Mini Pentagon also offers the instant choice between a straight or serrated edge for multiple cutting tasks. Twin thumb notches on the blade enable accurate blade orientation and downward control. Like its big br.. The SEAL Pup Elite is our high performance new edition to the existing SEAL family of products. Sometimes we just ‘have to have’ more horsepower, the racing suspension, and every available option including sunroof. All kidding aside the SEAL Pup Elite is serious business and carries on the tradition of supplying the worlds elite military forces.Durable general purpose knife - ideal size for hiking.. The first thing that is obvious about the Force is how stout it is. The thick blade and minimal grind profiles maximize the strength of the blade. This is a beast of a knife and will be virtually unbreakable. The full tang runs out the back of the glass-reinforced handle and into a glass breaking point. The handle is perfectly contoured and covered in aggressive checkering that is not for the fai.. The Agency follows a SOG tradition of recreating and modernizing historic classics. This unique knife was shrouded in secrecy and originally created for special CIA operatives in the early days of the Vietnam War. It was designed for clandestine and counter insurgency teams who lived in the jungle for months at a time and saw vicious close quarter combat. Never before reproduced, the beaut.. The Agency follows a SOG tradition of recreating and modernizing historic classics. This unique knife was shrouded in secrecy and originally created for special CIA operatives in the early days of the Vietnam War. It was designed for clandestine and counter insurgency teams who lived in the jungle for months at a time and saw vicious close quarter combat. Never before reproduced, the..
With our Aura line, we built on the traditional ideas of the past and evolved them for the future. We thought about weight, ease of carry, safety and intuitiveness. We studied the original bowie knife created by Rezin Bowie in 1838. We considered utility, ergonomics and comfort. The result... the Aura fixed blade. We used a high impact and tough glass-reinforced polymer handle that is over..
One of the more dramatic blade shapes in the SOG arsenal, the Creed delivers on its promises of high-level performance. The very stout front end weights the knife forward for chopping and piercing. The big belly on the blade maximizes the cutting edge for extreme wilderness and hunting situations. Mated with the Tech Bowie handle to provide a confident grip in inclement weather. This is a .. The challenge was to create a new breed of extreme fixed blades... suitable for today's modern military, capable night and day, wet or dry, and able to be carried in a variety of ways. But you might ask, what could possibly be new in a fixed blade? The Daggerts easily answer this question with contemporary solutions and have been tuned and tweaked for performance at every level. W.. The challenge was to create a new breed of extreme fixed blades... suitable for today's modern military, capable night and day, wet or dry, and able to be carried in a variety of ways. But you might ask, what could possibly be new in a fixed blade? The Daggerts easily answer this question with contemporary solutions and have been tuned and tweaked for performance at every level. &.. The SCUBA/DEMO is the rarest of the Special Forces SOG knives in existence. In fact, only one original is known to exist today. Originally, 39 were made and 38 of these were delivered to the Naval Advisory Detachment for missions on the North Vietnamese coastline. They were issued to OPLAN 34 ALPHA in 1964 at which time 36 were lost in operations and two were never seen again. Using curren.. The Field Pup is a beautiful knife with its black TiNi finish, for low reflectivity. It's the right size and weight, suitable for a variety of outdoor sporting tasks. It's comfortable to use with its slightly yielding Kraton molded handle that form fits the full tang blade. 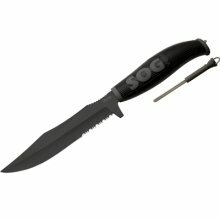 SOG's trademarked finger grips are combined with aggressive thumb notches on the back of the blade, making the Field .. The Field Pup is a beautiful knife with its high gloss satin finish, typically found only on expensive knives. It's the right size and weight, suitable for a variety of outdoor sporting tasks. It's comfortable to use with its slightly yielding Kraton molded handle that form fits the full tang blade. SOG's trademarked finger grips are combined with aggressive thumb notches on the back of th..
. The Field Pup II is a beautiful knife with its black TiNi finish, for low reflectivity. It's the right size and weight, suitable for a variety of outdoor sporting tasks. It's comfortable to use with its slightly yielding Kraton molded handle that form fits the full tang blade. 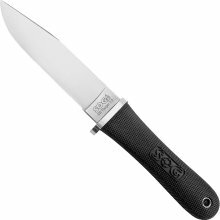 SOG's trademarked finger grips are combined with aggressive thumb notches on the back of the blade, making the Field Pu.. Among other things, SOG has a reputation for producing some of the finest production fixed blades in the world. Now we have developed along with military consultants an even more economical choice with the Fixation series. Seamless fits between blade and cross guard, wrap-around checkered handles, blade grooves, thumb notches, spanner nuts, and crossguard cutouts all say this knife is as d.. The first thing that is obvious about the Force is how stout it is. The thick blade and minimal grind profiles maximize the strength of the blade. This is a beast of a knife and will be virtually unbreakable. The full tang runs out the back of the glass-reinforced handle and into a glass breaking point. The handle is perfectly contoured and covered in aggressive checkering that is not for .. The SOG Forge evokes a period in Japanese history when honor was the most highly coveted virtue; It was a time when everything was handmade with meticulous care. A good knife or sword was meant to last for life- and as such, The Forge is built using both traditional and modern methods. It projects a sense of elegance and sophistication at the same time- The VG-10 san mai blade is hammer fo.. The Gov-Tac transcends the competition with double precision ground grooves, thumb control ridges, and an extremely thick blade. Other features include: An instinctual new handle shape with bold diamond checkering and scored with grip lines Signature washer construction that has never before been accomplished with a molded Kraton rubber grip handle SOG´s low-reflexive ..
For the primitive in all of us. When the only thing that separates you from them is your equipment, it better be good. The Jungle series is durable and comfortable with a molded Kraton handle that features our trademark Digi-Grip handle texture, a way to guarantee gripping power where you need it. Now with three distinctive blade shapes there is one for every taste. The Primitive is hard to cate.. Description: For the primitive in all of us. When the only thing that separates you from them is your equipment, it better be good. Using SOG’s Hardcased black coating, the Jungle Primitive is durable and comfortable with a molded Kraton handle that features Digi-Grip™, a way to guarantee gripping power where you need it. One can instantly turn the Primitiv..
Sportsmen, fishermen, hunters, and outdoor enthusiasts require a knife that can fulfill a variety of tasks, is easy to carry, and can perform in a wide range of environments. With an elongated clip point blade, flat ground bevels, and compact size, the Northwest Ranger is more than up to the task. Blade Length 5.2" x .150" Overall Length 9.925" Weight 6.2 oz. Edge Straight Ste..
An evolution of the proven and world carried SEAL Pup, the Ops features a recurved edge that has a longer cutting length, a drop point tip which increases strength, large thumb scallops for additional control, and perfect balance for instinctive movement. Combined with a choice of our nylon MOLLE or Kydex like tactical sheaths, you have what we think is the optimum knife for armed forces t.. The compact version of the original SOG Pentagon, the Mini Pentagon is a serious back-up knife that easily conceals in boot or vest. Extremely lightweight and comfortable to maneuver, the Mini Pentagon also offers the instant choice between a straight or serrated edge for multiple cutting tasks. Twin thumb notches on the blade enable accurate blade orientation and downward .. Originally designed as back-up for law enforcement and military personnel, the Pentagon series is now popular with outdoor knife enthusiasts as well. The Pentagon offers the instant choice between a serrated or beveled edge for cutting options. Twin thumb notches enable accurate blade orientation and downward control. The aggressively checkered, flared handles provide confident gripping..
Like its big brother, the SEAL Pup has a partially serrated blade that is powder coated for low-reflection and corrosion resistance. Its lightweight, glass-reinforced nylon (GRN) handle features a raised diamond pattern for secure gripping in inclement weather. And like the SEAL Knife, it carries conveniently in a multi-mounting tactical Nylon sheath . Blade Length 4.75" x.. The SEAL Pup Elite is our high performance edition to the SEAL family of products. Sometimes... we just "have to have" more horsepower, the racing suspension, and every available option including sunroof. All kidding aside- the SEAL Pup Elite is serious business and carries on the tradition of supplying the worlds elite military forces Features include: Thicker steel stock (.18.. The SEAL Pup Elite is our high performance edition to the SEAL family of products. Sometimes... we just "have to have" more horsepower, the racing suspension, and every available option including sunroof. All kidding aside- the SEAL Pup Elite is serious business and carries on the tradition of supplying the worlds elite military forces. Features include: Hardcase Black TiNi bla.. The SEAL Pup Elite is our high performance edition to the SEAL family of products. Sometimes... we just "have to have" more horsepower, the racing suspension, and every available option including sunroof. All kidding aside- the SEAL Pup Elite is serious business and carries on the tradition of supplying the worlds elite military forces. Features include: Thicker steel sto..
Like its big brother, the SEAL Pup has a partially serrated blade that is powder coated for low-reflection and corrosion resistance. Its lightweight, glass-reinforced nylon (GRN) handle features a raised diamond pattern for secure gripping in inclement weather. And like the SEAL Knife, it carries conveniently in a multi-mounting tactical Nylon sheath. Blade Length 4.75" x .16" Ov.. The SEALs are one of the most specialized elite military groups in the world today. SEALs must undergo one of the most rigorous training programs devised to produce the consummate warrior. Only a select few endure and earn the right to wear the SEAL Trident on their uniform. The SEAL Team knife, formerly known as the SEAL Knife 2000, evaluation program included: tip breaking stres..
Our machetes are exciting additions to the SOG family. Its not should I have a machete but which size will work for me. Machetes are one of the more useful edged tools in the world. They have cleared brush, and blazed trails, have chopped wood, made shelters, harvested crops, prepared meals, hunted and protected. Careful attention has been given to the SOGfari to make sure that the weight ..
How appropriate that for our 20th anniversary we launch a new adaptation of the original SOG Bowie that founded the company. This new large format 7-1/2” blade will stun you with its exacting construction and precise grind lines. Unlike the originals, all parts are protected with our Hardcased™ Black TiNi coating that is the very best for appearance and performance. The stacked leather washer hand..
"You can only lead from the front" is a favorite expression of ours. If you are one of those people who covet the ultimate ultimate... then we have a surprise for you. The Team Leader exemplifies the exceptional with incredible balance and streamlined aesthetics. Comes in AUS-8 stainless for a great combination of performance and price. Blade Length 5" x .16" Overall Length 10.25..
Based on the classic SOG Bowie that founded our company, but morphed into a top-notch work knife with the use of technology, modern materials, and a little class thrown in for good measure. For starters all the metal parts are satin finished stainless steel, polished to a mirror shine... It looks incredible! Offset against this, the tactile Kraton rubber handle nods to tra.. In the presence of the revised Tigershark series, one’s pulse quickens. It is instantly recognized for its signature handguard and defensive rear point, which are removable for a more streamlined look. But it is also familiar as the largest member of the SEAL series with precise grind lines, scalloped back edge, touch point checkering, and superior ergonomics. The Tigershark is cap.. In the presence of the revised Tigershark series, one’s pulse quickens. It is instantly recognized for its signature handguard and defensive rear point, which are removable for a more streamlined look. But it is also familiar as the largest member of the SEAL series with precise grind lines, rasped back, touch point checkering, and superior ergonomics. The Tigershark is capable..
With the reintroduction of this popular SOG knife, we have taken what made the Tsunami so great and improved it. Some of the changes are subtle- like refining the overall balance. Some are more obvious, like the grooves in our crossguards and the option of a tough TiNi coating. Finally, the beautiful Tsunami blade shape is mated perfectly with an extremely tactile diamond checkered Krato..
With the reintroduction of this popular SOG knife, we have taken what made the Tsunami so great and improved it. Some of the changes are subtle- like refining the overall balance. Some are more obvious, like the grooves in our crossguards and the option of a tough TiNi coating. Finally, the beautiful Tsunami blade shape is mated perfectly with an extremely tactile diamond checkered Kraton .. Radical blade grinds have been one of the signatures of SOG’s knives, but to produce these complex blade shapes and grinds requires the finest attention to detail. Perhaps this helps to explain why the Vulcan Fixed Blade (VFB) is so special. Each side of the knife has three separate grinds that come together to make a strong powerful knife. The reverse curve in the VG-10 blade is further e..
That feeling of leaving civilization behind as you move out of the valley and into the woodline is the inspiration for this series of fixed blades and folders. These big upswept blades meet the challenges of extreme camping, hunting and survival chores. The Blade is anchored in a handle comprised of stainless steel bolsters and beautiful hard wood. The handle configuration insures a solid ..
For the primitive in all of us. When the only thing that separates you from them is your equipment, it better be good. The Jungle series is durable and comfortable with a molded Kraton handle that features our trademark Digi-Grip handle texture, a way to guarantee gripping power where you need it. Now with three distinctive blade shapes there is one for every taste. The Primitive is hard t..